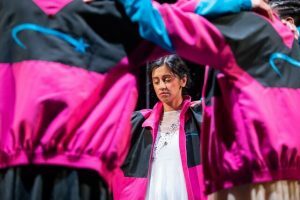 Dance Nation showcases the distinctive, refreshing voice of writer Clare Barron with highly engaging performances from its eminently likeable, predominantly female cast, most of them playing pre-teens, all of them adults. It is a play about adolescence, more specifically the experience of approaching womanhood. This reviewer cannot speak for the play’s accuracy in depicting this subject, nonetheless it is a varied, relatable and deeply affecting representation of this most formative of stages. The play draws from a wide array of influences, the over-arching narrative is firmly situated within the fluffier end of teen friendly sports films: a group of plucky underdogs have their friendships tested while attempting to win a regional dance competition. Stylistically Bijan Sheibani‘s production contains a liberal smattering of darkness more reminiscent of the more adult-end of coming of age dramas; Dario Argento, Sam Raimi and of Course Brian De Palma’s Carrie appear to have influenced the play’s more feverish moments of bloody awakening. The play also contains some unexpected structural diversions, particularly the reflective monologues spoken from the adult perspective of certain characters. These moments give the events a weightier depth of meaning and invite the audience to reflect on the significance of the intense, fleeting sensations we feel in our teenage years that so often echo throughout our adult lives. Dance Nation‘s ensemble cast do an excellent job; Brendan Cowell holds his own as the sometimes slimy, occasionally pathetic but consistently endearing Dance Teacher Pat. Karla Crome‘s Amina, a prodigy among the hobbyists, is a heart-breaking, frustrating and thoroughly well observed depiction of awkward teenage humility, unable to embrace the talent that will inevitably alienate her from her peers. Ria Zmitrowicz‘s Zuzu is the closest the play has to a conventional protagonist as she struggles with puberty, insecurity and the realisation that she isn’t the person she thought she was. Zmitrowicz plays her with a superficially convivial charm but is charged by a corrosive spite that makes a potentially tedious journey of self-discovery a thoroughly magnetic spectacle. Review written by Dean Elliott.